Jess contacted me in late summer of 2013 and asked if I would be interested in photographing her for the cover of her upcoming debut release. Being a fan of Jess’s attitude and the positive energy that she had been infusing the Syracuse music scene with since she arrived here, I was definitely into helping her out. She had some basic ideas for the images, envisioning black and white photos and showing her song’s lyrics written on her body. Other than that, she was open to ideas. The glass ashtray was photographed on a black plexiglass sheet for the cover of the cd artwork. I had picked up an awesome glass ashtray for decor at a fantastic place called Flower Child Vintage in Columbus, Ohio awhile back. It is a beautiful piece that really pops when it is all lit up with sunlight. I was excited to be able to use it for a shoot, it was a perfect fit. We photographed the ashtray on top of a black plexiglass sheet so it would really pop and we’d get some reflections beneath it. It was my first time photographing smoke but I was really pleased with the results. 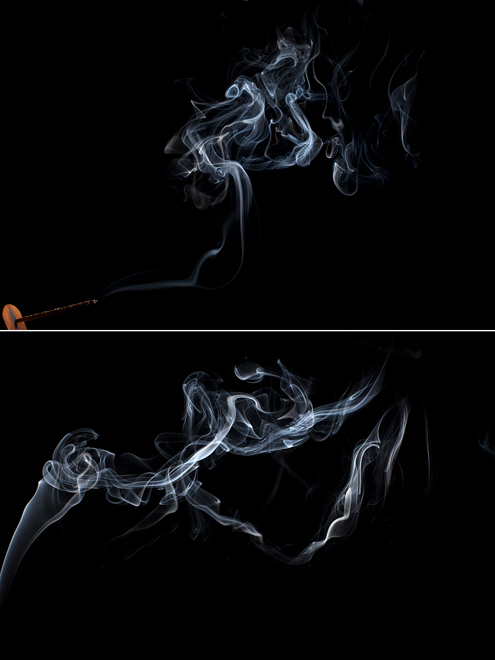 We found that shooting smoke that is wafting up from an incense stick using a speedlight or small studio strobe with a tight grid makes for some dramatic contrast. (We used an Alien Bee B800 with a 20° grid.) I loved photographing smoke. Such dreamy images were captured. Photographing smoke is kind of addictive. 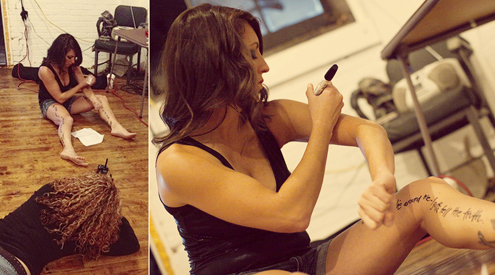 Jess was photographed last, fresh from her hair and make-up session with the fabulous Erica Abdo. We set up in The Gear Factory and photographed her on an all black backdrop, making it easier to place her into the ashtray during the editing process. She wore a white, fitted dress and tan boots, a subtle visual reference to a cigarette and it’s filter. When you are photographing subjects that will be combined into a composite image, it is important that the quality, intensity and direction of the light is consistent for each element of the scene. 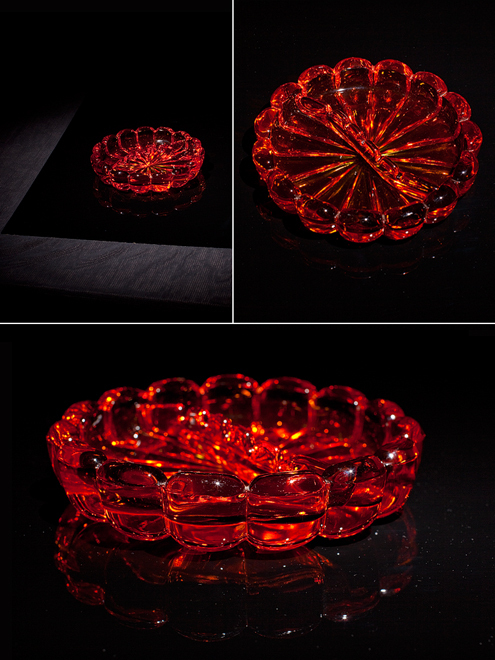 For instance, we photographed the ashtray with one strobe, placed high and to the right of the camera, with a 30° grid. We then also photographed Jess with one strobe, placed high and to the right of the camera at the same distance and angle, modified with a beauty dish and grid. We placed bins of differing heights beneath the black cloth to mimic the sides of the ashtray and had Jess use them to help her pose in the correct positions. These steps were taken to make sure that, in the end, the eye believes that Jess is actually sitting in a life sized ashtray. The image of Jess that was used for the cover (bottom) is a hybrid of two different photos of her (top and middle). 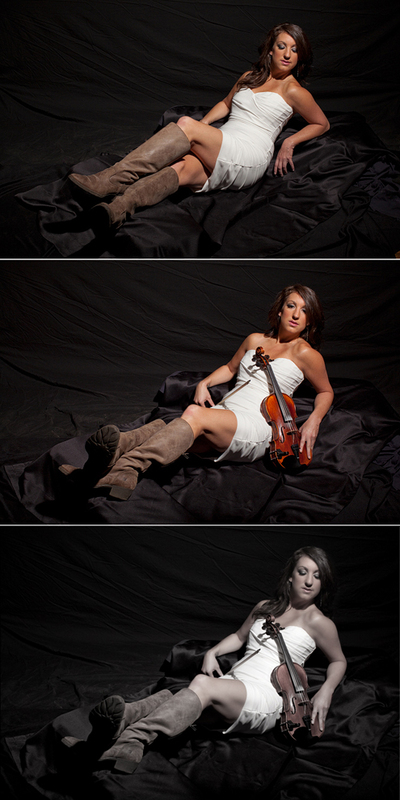 Some alternate shots of Jess from our shoot. After the ashtray shots in the dress and boots were completed, we started on the shots of Jess with the handwritten song lyrics on her body. Jess wrote her song lyrics on herself so they were in her own handwriting. The handwriting on body images were used for the back cover of the CD case, as well as on the inside right, underneath the CD. 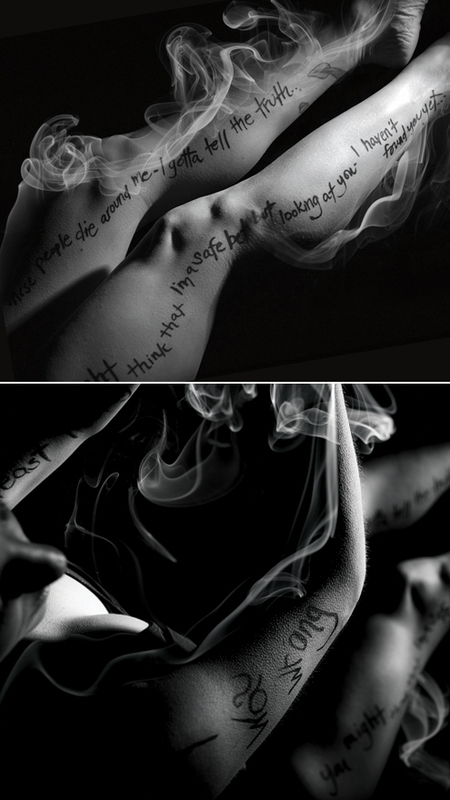 One source, high contrast lighting was used and smoke was added to the black and white “body writing” images to carry a consistent visual theme throughout the cd artwork. An alternate ashtray composite image that was not used in the Cd artwork. After the shoot was completed and her favorite shots had been selected from the proofs, we began focusing on the styling for the typography and graphic design of the cd case. Jess had relayed that she wanted a feminine, clean and contemporary feel for the artwork, almost a “pop music” type of vibe. She had a specific style of font that she envisioned for the cover. We brought all the elements together to create the final artwork for Bad Habit . Jess was willing to go with an actual creative concept for her CD artwork as opposed to just wanting a pretty portrait of herself in a pretty place to use for a cover. These are the kinds of projects that genuinely interest me, so I was really happy that she trusted me and allowed us to bring the vision I had for the artwork to life. 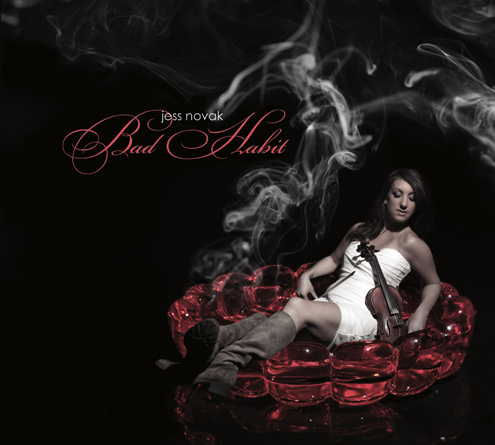 Bad Habit is available for purchase on iTunes.